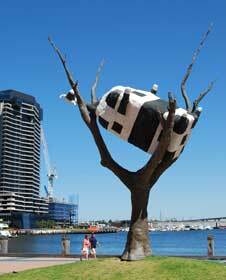 .........First though, as there's a bit of walking to do around town, pop into the Melbourne Visitors Centre here in Federation Square and pick up a map of Melbourne. (The Visitor Centre opens at 9am). .........It's for kids up to about 8. 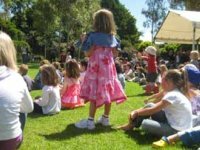 There's lots to do here including storytime sessions between 10.30am and noon on Sundays. Note it's closed here Mondays though so plan accordingly. 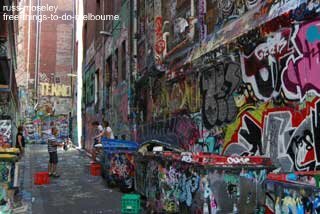 Next, it's a visit across the road to a couple of Melbourne's famous graffitti covered streets - you'll find Hosier Lane almost opposite Kids Corner on the other side of Flinders Street. Rutledge Lane is also down this street. Then it's a short walk up to the State Library of Victoria. Turn left at the top of Hosier Lane and down to the main street which is Swanston Street, turn right and the Library is at 328 Swanston Street, about a 5 minute walk on the right hand side, opposite Melbourne Central. You'll pass Melbourne Town Hall on the way. The Beatles apparently waved to crowds from the Town Hall balcony which you'll be walking under. 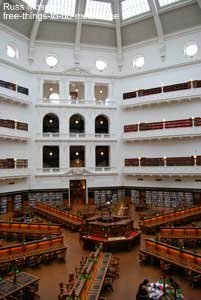 .........I'd especially recommend you also take a look at the gorgeous La Trobe reading room too - just follow the signs. .........It's a lovely arcade to spend time window shopping or having a cup of coffee while you wait. Have a look at this morning's route on the map below. Just click on the blue link under the map to make it larger and then click the +, - and arrow buttons at the top left of the map to see what you need. You can also click on the blue markers to see what the attractions are. I've got two more things for you to do this afternoon. First we'll jump on the free tram for a look around Docklands so head down to Flinders Street and catch the burgundy coloured City Circle tram heading away from Federation Square. Have a look at the map below showing you where to go. (Same user instructions as for the map above)! .....Oh, there's a few boats to see too! If you're in need a of a meal here between Mondays and Thursdays there's an offer where kids can eat free at a number of Docklands restaurants (subject to conditions of course!) 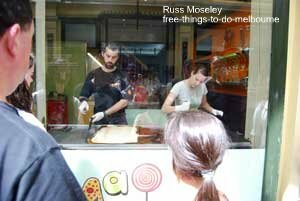 - see Kids Eat Free. 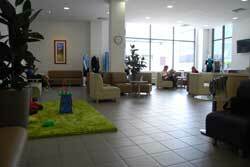 .........You can get a free cup of tea or coffee and a newspaper read here before about 3pm. .........Unfortunately you'll need to pay normal fare on the St Kilda tram but if you do the trip on a Sunday you'll only need to pay $3.20 per adult instead of the normal $10.20 off-peak daily charge. This $3.20 gives you all day travel on a Sunday so it's a real bargain. You could probably do this penguin sightseeing trip within 2 hours though so a $3.80 adult fare Mon-Sat should be ok as long as you're back on board the return tram within 2 hours of paying your fare. The two hour fare for children under 16 is $2.40 and kids under 4 travel free (the tram/train company say it's under 3's on their website but I've asked at ticket places and been told it's really age 4!!). .........It's a 20 minute journey on this tram and you need to get off at the bottom of Fitzroy Street (at Jacka Boulevard). The pier is only a couple of minutes away from here - just head towards the sea! You then need to walk along to the end of the pier, behind the building on it. 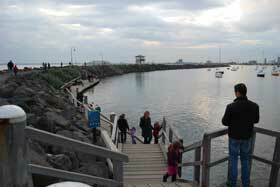 This is the breakwater and home of the penguins. See the map below to see where you'll be going. Follow the instructions to use the map as I explained by the first Google map above. You should get here at least half an hour before dusk if you want to take photos - and you will want to take photos!! to my YOUR Stories page. Yes, People Will LOVE To Read YOUR stories and see YOUR photos!! Just click HERE to send YOUR Photos and Stories! !